Moshirolmamalek Hotel Yazd is an old garden remained from the Qajar Era, which has distinguished it from other hotels; it helps the guests of the hotel to experience living in the past time of Iran. The garden, flowing creeks, rivers, and fountains of the hotel have made it an attractive place to dwell. Two African red and blue parrots and two men, one sturdy and another a short one, clad in old cloths including turban and hat, etc. are among the fixed characters of the hotel to which most guests are attracted when they enter the hotel. There is a small shop in the garden in which guests can find various sorts of Iranian handicrafts. 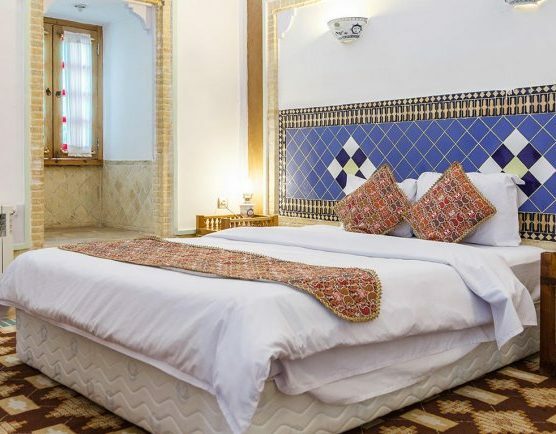 Hotels rooms’ with the Kavir’s special architecture and style are arranged through both sides of the garden; there is a clean and tranquilizing lobby in the hotel also which all have made the hotel a good place for resting and meditation. The garden has been designed with several paths which connect the parking area into the rooms’ area and the whole area is covered with tall trees which form a tunnel of leaves when one walks beneath them. Passing the tunnel, especially in morning and evening, develops a certain sense of jubilation thanks to the sun’s radiation angle and birds song.